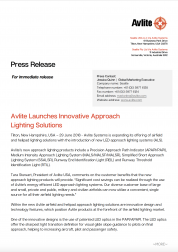 Avlite Systems is expanding its offering of its airfield lighting solutions with the introduction of new LED approach lighting systems (ALS). Avlite’s new approach lighting products include a Precision Approach Path Indicator (PAPI/APAPI), Medium Intensity Approach Lighting System (MALS/MALSF/MALSR), Simplified Short Approach Lighting System (SSALSR), Runway End Identification Light (REIL) and Runway Threshold Identification Light (RTIL). 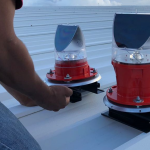 Within the new Avlite airfield approach lighting solutions are innovative design and technology features, which position Avlite products at the forefront of the airfield lighting market. One of the innovative designs is the use of patented LED optics in the PAPI/APAPI. The LED optics offer the sharpest light transition definition for visual glide slope guidance to pilots on final approach, helping to increase aircraft, pilot and passenger safety. Avlite’s approach lighting systems can be powered by universal mains or solar. Additionally, the PAPI/APAPI accepts a constant current regulator supply. All approach systems are available in either a permanent or a portable configuration. For example, the ten foot, MALSR barrette is available in a lightweight, folding portable version for simplified transportation and installation. Avlite’s new approach lighting products are designed by subsidiary Laser Guidance Inc, and add to the company’s expansive line of airfield lighting solutions. For more information on the new range of approach lighting solutions click here.